I am travelling from Salerno to Turin in a few days and plan to take the overnight train to maximise my time in Italy. The fact that the train is taking an unusual routing due to engineering works is an added bonus, although it means being awake at 3am to see if we do go the unsual way! 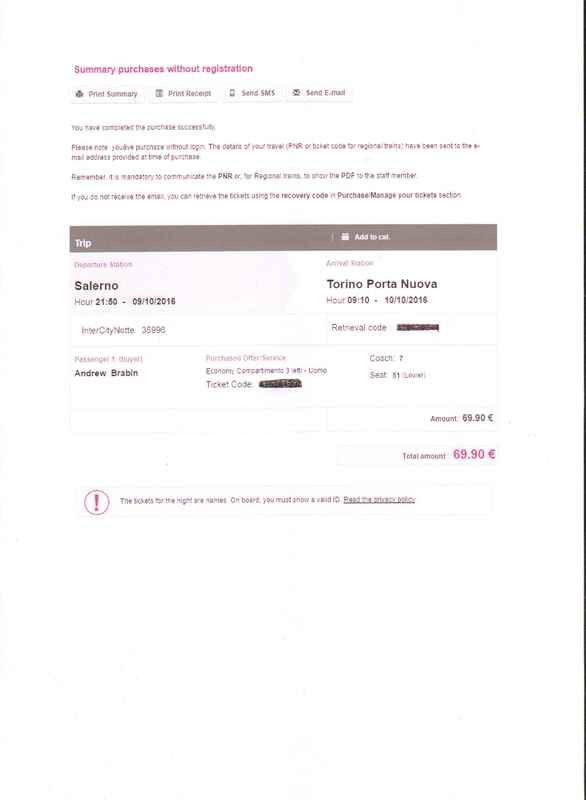 I had a choice of booking with Loco2 or directly with TrenItalia. 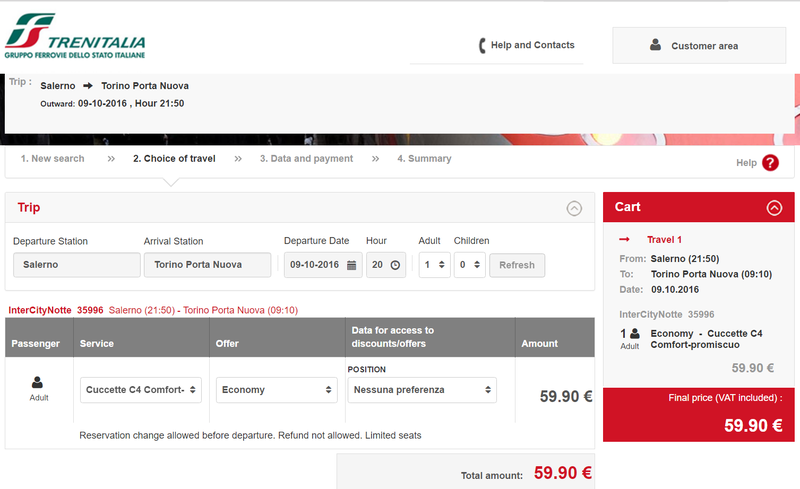 My preferred method would be to use Loco2, I find their system easy to use, but I needed to make a comparison to booking directly with Trenitalia, who operate the train. 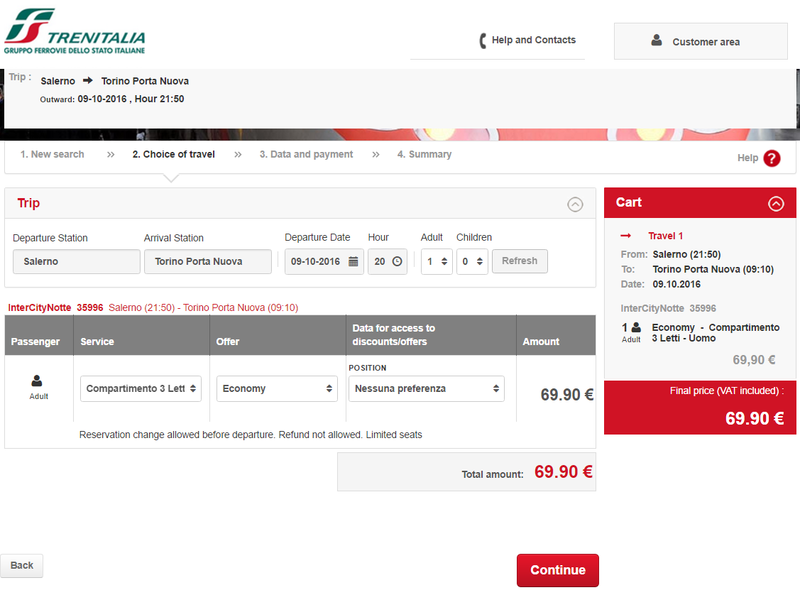 Load the TrenItalia website, click here for the English version. Enter your journey details, in this instance Salerno to Torino (you must use the Italian spelling of place names) and the date of travel and an approximate time. A list of trains will show with the departure time and arrival time and total journey time. Click on the square with the white cross on the train you wish to travel on, in this instance the 21.50 departure train number 35996 that arrives into Turin at 09.10. 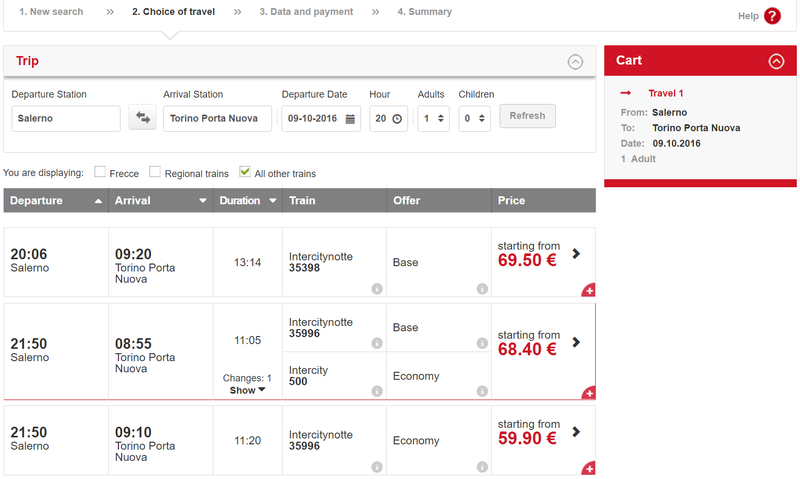 The details of the train to be booked will display together with the lowest fare available on that train. In this instance it is a space in a 4 berth couchette at €59.90. Click on the Service box and a list of the available accommodation on the train is dispalyed. At this stage you are able to choose which berth you want to reserve, my preference is for the lower berth as I do not want to be climbing up and down during the night! To choose which berth you would like click on the Position Box which displays Nessuna preferenza, if you leave the choice as this you will be allocated a berth randomly. There are 4 choices of which 3 are obvious Upper, Middle and Lower - which are requests and if your requested type is not available it will book an alternative berth type. The fourth type allows you to specify you only want a lower berth and if it is not available it will not make a reservation. 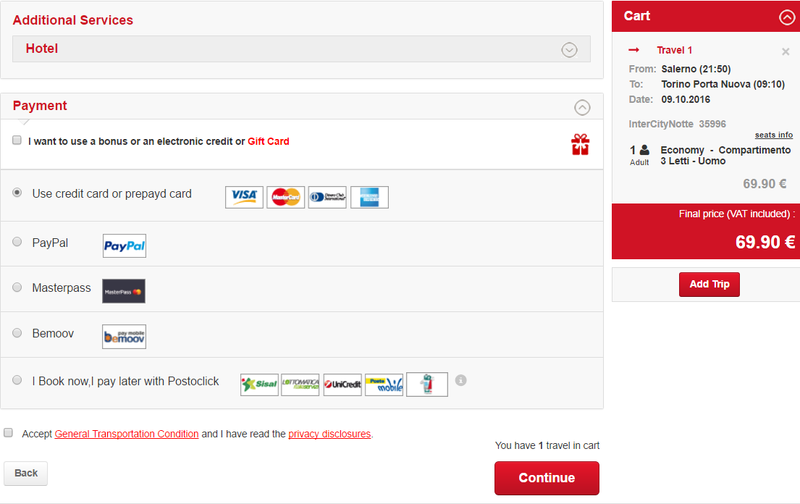 This is also step that payment must be entered, the usual credit cards are accepted as well as payment by PayPal. The next step is to fill in the payment details, in this case I am using a UK issued Visa Card offered by Nationwide Building Society as they do not charge any foreign exchange fees. Once payment is confirmed yu will get a confirmation of your booking. Your ticket will be emailed. Your ticket will arrive by email. This is an e-ticket so I am all set to travel! 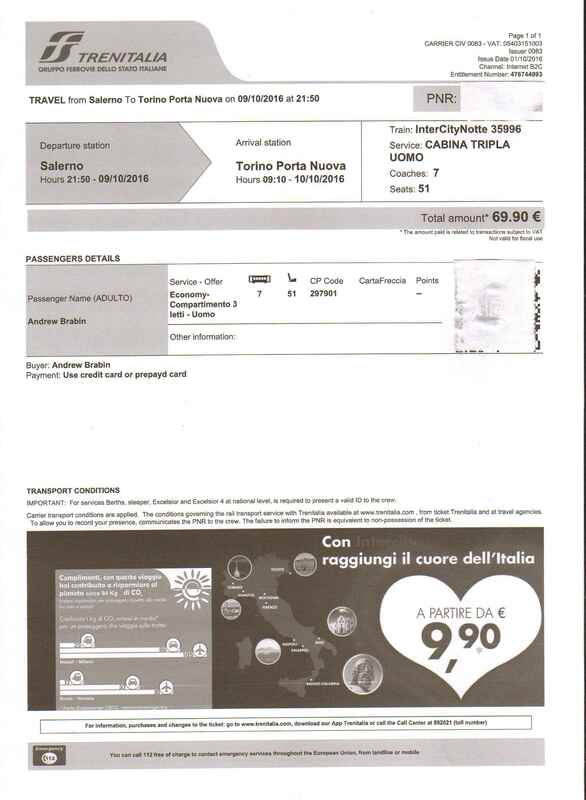 As with all Trenitalia’s long-distance trains, tickets always include a seat reservation – in other words, you can’t just turn up and hop on, you need to buy a ticket which will include a seat reservation for a specific train, but you can do this right up until departure using the self-service machines or at the ticket office. Trenitalia E-Ticket Bimbi Gratis Fare One child under the age of 15 travels for free, while up to four accompanying adults pay the base fare. Thanks so much for this article, very helpful! The one question I still had is if I’m trying to book a Posto Doppio Compart. Intero for my girlfriend and I, do we both have to select that option under the “Service” dropdown? Does the system know that if we are booking together, with that same option, that it means we want to be in the same compartment, rather than 2 separate compartments? Hey Andy – Thanks so much for the clarification! I was able to successfully replicate this when going to book. I selected the same option for both, and when checking the seat selections, I had 51 and 55 in the same Coach # as you stated. This worked perfectly. Thanks! Thank you so much for the clear explanation. This has really helped me. 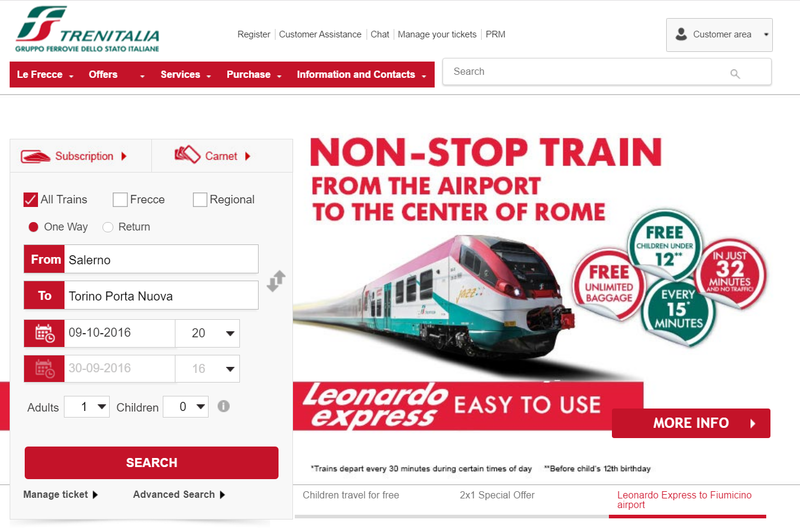 I hope that Trenitalia link to this page to help us novice Italian speaking Brits. I am going to embarking on a mammoth round trip from the UK to Malta by train and ferry taking in Paris, Venice, Rome, Catania, Malta then back via Florence and Milan. As I will be a solo female traveller, I am taking the expensive option of single sleeper compartments but am really looking forward to the experience. 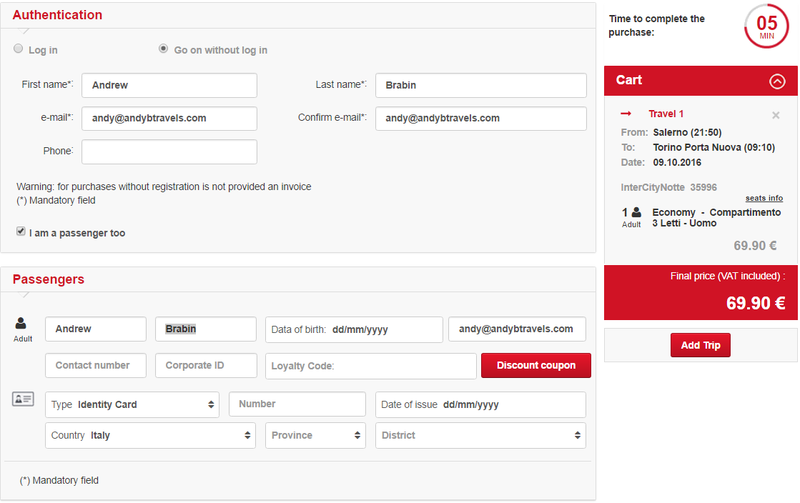 I should add that I used the Thello site to book the legs from and to Paris. In my experience, their site was really easy to navigate. Disappointed with Italiarail because they only allow booking for posto doppio as a minimum occupancy and when I received my ticket, it had me listed as male! I have asked them to change it but they can’t. Their site says ” you can’t choose your seat…..yet”. Sorry, in my view, not good enough so I’m taking the hit and getting a refund for the initial sleeper booking I made to Sicily. But thanks for your really helpful information! Ciao e molto grazie! 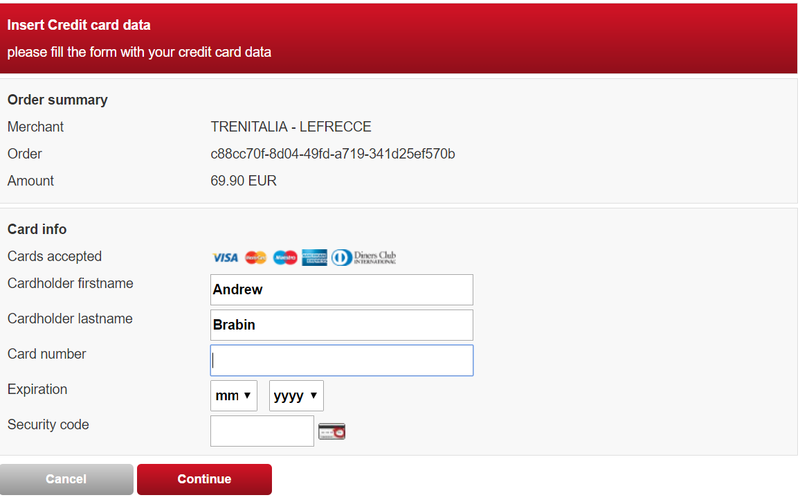 Chris – which site did you use to book the Italian Sleepers: trenitalia.com? Next story The Trans-Siberian Railway is 100!